After nearly 40 years in nursing, Linda Knodel has witnessed many changes in the field, including the expansion of technology in patient care, shifts in care settings and skill sets, and even changes in the work-life balance expectations of nurses. But one thing has remained constant: “Nursing continues to be the most trusted profession,” said Knodel, senior vice president and chief nursing officer at Chesterfield, Mo.-based Mercy health system. “I also believe that nurses have embraced the changing landscape, have always been the coordinators of care, and today have great opportunities to extend this work in settings yet to be defined,” said Knodel, 61. As the nation changes how it delivers healthcare, nurses will play an even larger role. “Because care will be delivered in so many places—to keep people out of the hospital—the opportunities are just exponential,” she said. Knodel said today's challenges in nursing are even harder because of the pace of change. “We have all been through cyclic patterns when nursing shortages existed, but it's different today,” she said, noting that a large number of baby boomers will retire over the next few years. Replacing them is already more difficult because of a faculty shortage in nursing schools. But changing healthcare dynamics and technology also mean that “25,000 new jobs will emerge that we don't even know about today,” she said. Knodel wants to make sure that nurses have an integral voice in the discussion of how healthcare will be redesigned going forward, and sees that as a big part of her role at Mercy, where she represents the profession on the executive team. Knodel also works to help nurses play a more prominent role in their communities' big-picture healthcare decisionmaking. Knodel spent 15 years as a bedside nurse before entering the executive ranks. Before becoming CNO at Mercy, Knodel also served in that role for Mercy hospitals in the Springfield, Mo., area, and before that, spent more than two decades as senior vice president and CNO at St. Alexius Medical Center in Bismarck, N.D.
Outside of her work at Mercy—which includes 45 hospitals, in addition to hundreds of physician practices and outpatient facilities in Arkansas, Kansas, Missouri and Oklahoma—Knodel also helps recruit more nurses to serve on healthcare policy boards, whether it's in the corporate, government or not-for-profit sectors. Knodel has also shared her expertise internationally, which she said has been some of her most rewarding work. She has led groups of nurse executives to Costa Rica for discussions with nursing leaders there on healthcare challenges common to both countries. “Many times the issues are the same, and we can learn from each other,” Knodel said. She also said that an important part of her work has been “ministering care to children beyond the margins,” including a trip to Croatia, where she worked with teachers and children to improve dental health. Di Smalley, a past chairwoman of the ACHE, said Knodel is one of the few nurses to ever win the organization's Gold Medal Award. 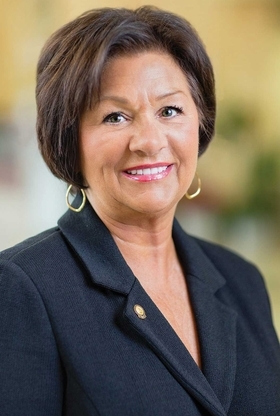 “It is fairly rare to have a nurse who sees herself as a healthcare leader and not just a nursing leader,” said Smalley, a regional president for the Mercy system in Oklahoma.